Matthew Apgar - mapgar@shawmedia.com Tim Baumgartner of McHenry, 28, is congratulated by friend Seth Lehman of Island Lake, right, after bowling a strike on Monday, Feb. 01, 2016 at 3D Bowl in Island Lake. 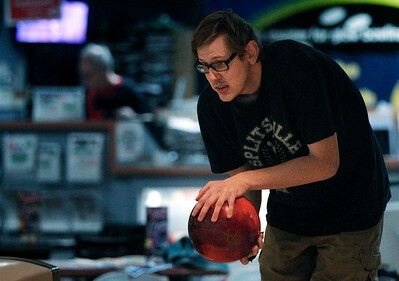 Baumgartner has been bowling for 16 years and has not let his autism and diabetes hold him back. He recently recorded 21 strikes in a row, including a perfect 300 game, during a three-game series on January 15. Matthew Apgar - mapgar@shawmedia.com Tim Baumgartner of McHenry, 28, bowls with friend Seth Lehman of Island Lake on Monday, Feb. 01, 2016 at 3D Bowl in Island Lake. 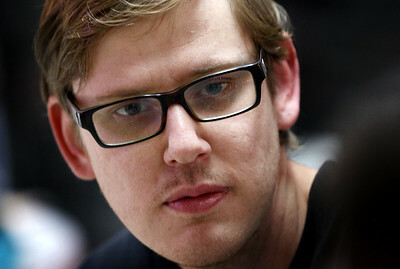 Baumgartner has been bowling for 16 years and has not let his autism and diabetes hold him back. He recently recorded 21 strikes in a row, including a perfect 300 game, during a three-game series on January 15. 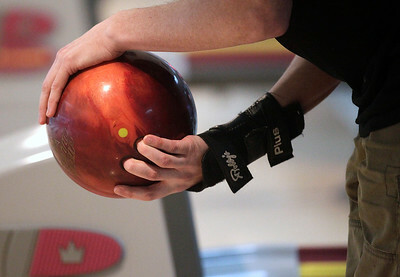 Matthew Apgar - mapgar@shawmedia.com Tim Baumgartner of McHenry, 28, polishes one of his bowling balls during a game with friend Seth Lehman of Island Lake on Monday, Feb. 01, 2016 at 3D Bowl in Island Lake. 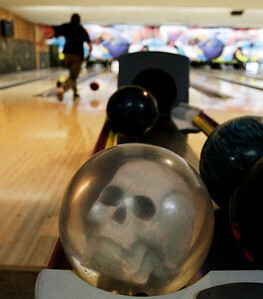 Baumgartner has been bowling for 16 years and has not let his autism and diabetes hold him back. He recently recorded 21 strikes in a row, including a perfect 300 game, during a three-game series on January 15. Matthew Apgar - mapgar@shawmedia.com Tim Baumgartner of McHenry, 28, bowls with friend Seth Lehman of Island Lake on Monday, Feb. 01, 2016 at 3D Bowl in Island Lake. 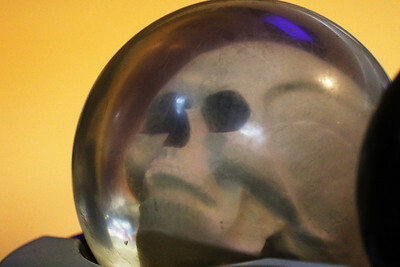 Baumgartner comes to the lanes prepared with multiple bowling balls for use in different scenarios, including this one with a fake skull inside of it, which he purchased at Savers. Matthew Apgar - mapgar@shawmedia.com Tim Baumgartner of McHenry, 28, focuses on the pins as he lines up his shot during a game with friend Seth Lehman of Island Lake on Monday, Feb. 01, 2016 at 3D Bowl in Island Lake. 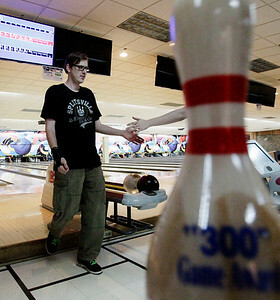 Baumgartner has been bowling for 16 years and has not let his autism and diabetes hold him back. 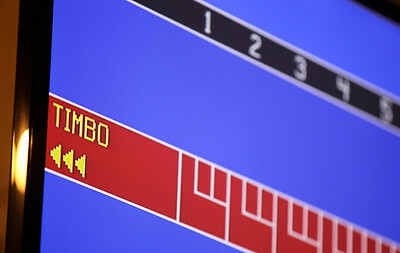 He recently recorded 21 strikes in a row, including a perfect 300 game, during a three-game series on January 15. Tim Baumgartner of McHenry, 28, bowls with friend Seth Lehman of Island Lake on Monday, Feb. 01, 2016 at 3D Bowl in Island Lake. 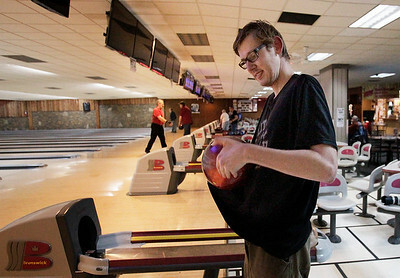 Baumgartner has been bowling for 16 years and has not let his autism and diabetes hold him back. He recently recorded 21 strikes in a row, including a perfect 300 game, during a three-game series on January 15.